A couple of years ago I made this recipe and served it at my bonfire night party, I had quite a few to feed so I used a huge pork leg which only just fit into the oven and slow roasted overnight on the lowest possible heat. Everyone said it was amazing, falling apart tender; we ate it stuffed into crusty rolls with rocket and relish. But the real triumph of the recipe was the spiced apple relish that goes with the pork. Just thinking about it makes my mouth water; I'm going to have to cook it again. The recipe came from the November 2006 issue of BBC Olive magazine. Heat the oven to 230 c / fan 210 c / Gas 8. Turn the oven down to 150 c / fan 130c / gas 2. Put the apples in a pan with the sugar, remaining cider, cinnamon stick, chilli and a good grating of nutmeg. Cover and cook over a low heat until reduced to a thick pulp. Tip the pan juices into a saucepan. 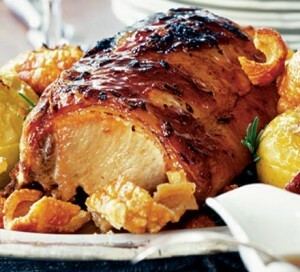 Cook the pork for a further 25-30 minutes until the skin has turned golden and very crisp. And don't forget the crackling!